The Trump administration is considering a new family separation policy, an arts group leader made a dramatic attempt to save several border murals from destruction and more in our biweekly roundup of news from the U.S.-Mexico border. 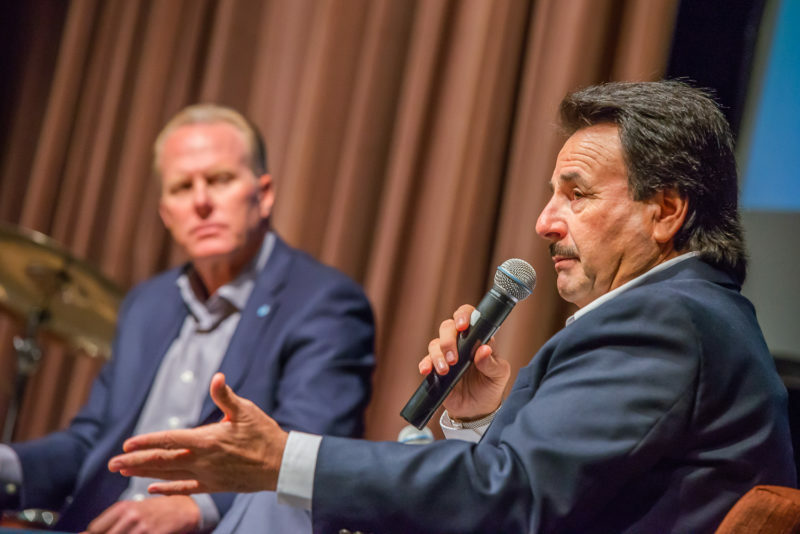 Juan Manuel Gastélum, the mayor of Tijuana, addressed some of the major challenges facing the city when he appeared at VOSD’s Politifest last Saturday. Gastélum’s acknowledged the record number of homicides and escalating violence in the city, but blamed police shortages and federal firearms laws for Tijuana’s problems. Gastélum said Tijuana authorities are pushing to end bail for pre-trial detainees who were caught with firearms, so suspects with weapons won’t be released from custody while awaiting criminal proceedings. Then he quickly pivoted to Tijuana’s growing economy. Later, Gastélum said a shortage of police has also contributed to problems in Tijuana. The city recently hired roughly 250 new police officials, he said, but needs about 700 more. The city has lots of empty police vehicles, with no one to staff them. Not just anyone can become a police officer, Gastélum said, before jumping into a soliloquy on the importance of raising good citizens. According to a report last week from Zeta, September saw 215 killings, five more than in August. The beginning of October was marked with an average of nearly six killings each day. Gastélum and Secretary of Public Security Marco Antonio Sotomayor have come under fire for how they’re handling security issues. In August, when cornered by Telemundo20 cameras and asked about Tijuana’s homicides and security risks, Gastélum evaded the question. “With all due respect, right now we are seeing good things, and that is what should be highlighted,” Gastélum said. In 2017, due to the deteriorating security situation in Tijuana, Gastélum signed onto a Baja California state security strategy, called the Security Crusade, which drew on policing strategies like stop-and-frisk and other zero-tolerance policing models, according to a February paper from the University of San Diego’s Justice in Mexico project. As the city’s response to the homicides faced criticism, Gastélum and Sotomayor have started pointing to federal shifts in trial procedures, like bail for suspects who have weapons. The pressure led to the push to hire additional police officers, according to the study. The paper’s authors presented other strategies to reduce the violence, which began to tick up again in 2015 as drug organizations splintered, re-organized and began new turf battles in the border city. The strategies include socioeconomic policies to help combat the marginalization of certain communities where the violence is most prevalent, different drug policies and ways of combating organized crime other than the kingpin strategy – the takedown of high-level cartel leaders – that has been prevalent in recent years. The Trump administration is, once again, considering ways to separate children from their parents at the border, the Washington Post revealed last week. There are still more than 200 children identified in the American Civil Liberties Union’s family separation lawsuit who still haven’t been reunited with their parents, KPBS reports. Some of the separated families, who were given the chance to re-do their asylum interviews as part of the settlement, filed an emergency motion last week that alleging the government is dragging its feet in conducting the interviews so families languishing in detention will instead opt for deportation, according to Courthouse News. An Amnesty International report found that more than 6,000 people were separated from relatives at the border from late spring to mid-August. In addition to the administration’s zero tolerance policy, which used criminal prosecutions of parents who crossed the border in places other than a designated port of entry to separate them from their children, the report also sheds light on how families have been separated even when they appear at a court of entry. An Associated Press investigation found that some deported parents, whose children were separated from them, may lose their children permanently to adoption. The construction of a new border structure in Calexico was recently completed, the Union-Tribune reports. Calle 13, an artist collective in Mexicali that had painted 35 murals on the old border fence, had been trying to save its artwork as the barrier was taken down and replaced. We paid a visit to them back in March and recently checked in on the status of the murals. In March, the art collective had tried to arrange an agreement with Border Patrol officials and the construction company building the structure, but weren’t having any luck. Two months later, construction workers began tearing down and destroying several art pieces. Thomas Gin, who grew up in the neighborhood along the Mexican side of the fence and founded Calle 13, tried to physically drag one of the pieces across the border to save some of the murals. When that didn’t work, he climbed on top of another one and refused to come down. A La Cronica photojournalist captured the tense moment. When Gin wouldn’t come down, Border Patrol officials fired tear gas in his direction, which caused him to lose his grip – but he managed to avoid falling off completely. Officials then tried once more to talk things out with Gin. They promised to meet with him soon to see how Border Patrol could help save the murals. Gin agreed, and climbed off. In the next couple of days, Gin said he didn’t hear back from Border Patrol, but did hear from the owner of SWF Constructors — the company in charge of the project — who ordered his employees to help preserve the next mural on the chopping block. Out of the 35 pieces, the mural of Aztec leader Cuauhtemoc by local artists Pablo Castañeda and Eduardo Kintero was the only one spared. The piece is currently displayed in the art collective’s studio just a couple steps away from its original location, but Gin said he’s working to find a permanent home for it. “I put my life at risk, but it was worth it,” Gin said. Thousands of people, both deportees and American addicts looking for a cheaper fix, are ending up on the streets of Tijuana. Buzzfeed looks at the growing public health problem caused by American-born addictions. KPBS sat down with Mexico’s ambassador to the United States to discuss the updated version of the North American Free Trade Agreement. A Family’s Choice: Struggle Together Abroad, or Live Comfortably Apart in the U.S.